Free solid colour match. Choose from COLOUR WIKI range or colour chart from Dulux, Taubmans, Wattle or choose your own colour, simply send us the physical sample. Colour Toning Glass insert to blend Bonethane sheets incurs a charge. ISPS can customise fire rated toughened glass for gas burner in either silver or optional colour - toned . VetroPoly or create a colour that adds contrast with Trim, filler EFX and cut to size options all inclusive and delivered to you for one cost call 08 8381 8880 for more information. 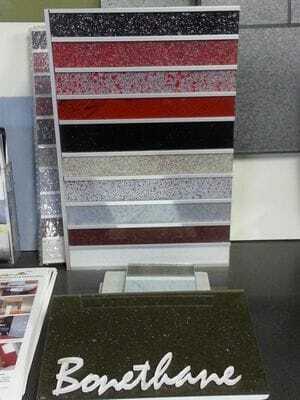 Filler EFX are a design custom made in combination colour, incorporating the colour spectrums in your interior project. They are designed to run through the course of the sheet vertical or horizontal creating a stunning boarder or continuous length. If your looking for something that captures your colour scheme add fillers to your order.